VALORUM is a cloud-based business management platform for individual fitness professionals and personal trainers which combines tools for managing leads, sessions, tasks, clients, workouts, emails, and payments. Users can streamline all aspects of their business and manage clients seamlessly in real time, in addition to providing clients with native, branded mobile apps (iOS / Android) to track all aspects of their experience. From the VALORUM dashboard, personal trainers can view client calendars, schedule and reschedule sessions and view and manage client contact information. Fitness professionals can schedule training sessions as well as workouts for clients to perform independently of the 1-on-1 training, and use drag-and-drop to quickly reschedule sessions. Clients will receive automated reminders to remind them of their upcoming sessions and boost attendance. With VALORUM, trainers can build custom workouts using the built-in exercise library, create and save templates, embed videos, and leave pre-and-post workout comments for clients. Users can also set up macro-nutrient guidelines for each client, and get a real-time view of their food journal. The custom, branded client mobile app for iOS and Android enables clients to access their workouts, log food, schedule sessions, and visually track all aspects of their training. VALORUM’s CRM tool helps fitness professionals to manage their leads or prospects, schedule follow-up tasks, and set reminders so nothing gets forgotten. The email engine enables users to create targeted campaigns using a drag-and-drop email builder to communicate offerings and promotions to clients, as well as build targeted contact lists. The finance dashboard allows fitness professionals to chart their net profit and view revenue against goals over time, track transactions, and monitor real-time revenue and expense data on demand. Users can take payments using the integrated payment module, or integrate VALORUM with over 100 payment gateways. Saves me tons of time, keeps me organized and my clients LOVE the mobile app! Easy to use, great design, tons of functionality, great price. I look so professional! Easy to use, great design, tons of functionality, great price. I look so professional! Would be great, as a trainer, to run it from my mobile but no big deal. Plenty of other reasons to love this software! $69 per month - everything is included and unlimited. Build brand value and boost client engagement with a branded client mobile app on iOS and Android which allows them to view their progress, schedules, track calories, and more. Clients can track their nutrition by scanning or searching VALORUM's database of over 250,000 foods, and keep motivated with goal setting and achievement badges to celebrate success. VALORUM provides integrated payments with a 2.75% true flat rate, or choose from 100+ third party payment gateway system integrations. Get real-time revenue and expense data on demand via the finance dashboard and discover what service packages are performing the best and at what price point. 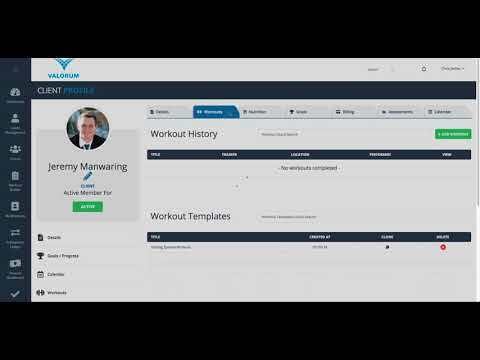 VALORUM's workout builder is designed to streamline the creation and management of workout sessions for clients, allowing users to create templates and comprehensive workouts. Below are some frequently asked questions for VALORUM. Q. What type of pricing plans does VALORUM offer? Q. Who are the typical users of VALORUM? Q. What languages does VALORUM support? Q. Does VALORUM support mobile devices? Q. Does VALORUM offer an API? No, VALORUM does not have an API available. Q. What other apps does VALORUM integrate with? Q. What level of support does VALORUM offer?